On June 1, Hawaiian monk seal R5AY gave birth to a seal pup at a North Shore location, the first seal born on Oahu in a public area since 1998. The two were basking in the sun yesterday. A Hawaiian monk seal who gave birth to a pup on Kauai last year is now mother to the first pup born on Oahu in eight years. R5AY, an adult female Hawaiian monk seal that frequents Hauula, gave birth on a remote North Shore beach, probably on June 1, said David Schofield, National Oceanic and Atmospheric Administration fisheries marine mammal response coordinator. A passer-by discovered and reported the pup, he said. Officials know the identity of the mother from a bleach mark they put on her shoulder last December. They have not yet determined whether the pup is male or female. They will do that and tag it when the mother weans the pup in five or six weeks. Officials are not publicizing the beach's location because they do not want people disturbing the pup and its mother, especially when they are nursing. "Just yesterday there was somebody taking pictures with 35-mm film. And just the sound of the shutter made the mother look up," Schofield said. He said unfamiliar sounds could spook the mother and cause her to stop nursing. Seals are also known to bite people who get too close. NOAA officials placed a barrier around the nursing pair to prevent people from getting within 150 feet. 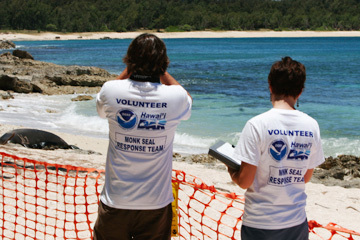 Volunteers monitor their behavior and educate whoever passes by about the monk seal's endangered status and efforts to protect it. Oahu Hawaiian Monk Seal Response Team volunteers Shawn Bonnell, left, and Jessica Smith recorded what the monk seals were doing yesterday. One of yesterday's volunteers was Karen Rohter, a fifth- and sixth-grade math and science teacher at St. Andrew's Priory. She has committed to a shift every Friday from 8 a.m. to noon until the pup weans and the mother leaves. Rohter plans to share her experience with her students. The mother and pup spend most of the day sleeping on the beach. They nurse three times a day. Rohter said one of the pup's endearing behaviors is that it mimics everything it mothers does. When the mother rolls over on its back, so does the pup, she said. But when they go into the water for a swim, the pup sometimes wanders off. When that happens, the mother brings the pup in line. "She kind of herds the pup if the pup gets into deep water over by the rocks. She'll kind of take it and move it over a little bit," Schofield said. When R5AY was first spotted on Kauai in 2002, she was already an adult. She gave birth at about this time last year on Kauai, said Erin Moreland, NOAA Fisheries Main Hawaiian Islands Monk Seal Sighting coordinator. Moreland said that pup survived and has been spotted on Kauai. The last Hawaiian monk seal birth on Oahu was a set of twins in Ko Olina in 1998. They died during birth. Single pups were born to three different mothers on Manana Island, also known as Rabbit Island, in 2003, 2004 and 2005. All pups have survived. 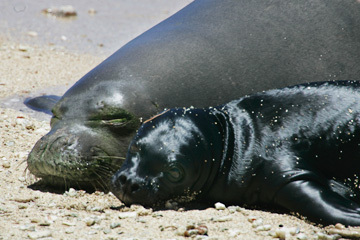 The Hawaiian monk seal population is estimated at about 1,200.